Even in 2014, forums are still very popular, despite the rising popularity of the newer forms of social networks. The beauty of forums is that they allow for a focused discussion amongst like minded people. However, forum software is notoriously sluggish, hard to manage and can cause many forums to eventually lose their spark. Wouldn’t it be great if you could turn your favorite CMS and blog platform into a full featured forum? Enter bbPress. bbPress is a forum application that comes in the form of a WordPress plugin. By using WordPress to power your forum, you can rapidly reduce the learning curve, for both users and forum managers. bbPress was developed by the people who also brought us WordPress itself. So, is WordPress really up for the the task? Can a CMS effectively be turned into a forum with all the standard features you would expect? We’ve seen WordPress being used in many different capacities, so we know the potential is there. In this article, I will take a look at how easy bbPress is to install on WordPress. I will also review the main features that make it so popular and how it stacks up against ‘traditional’ forum software and other competing WordPress forum plugins. 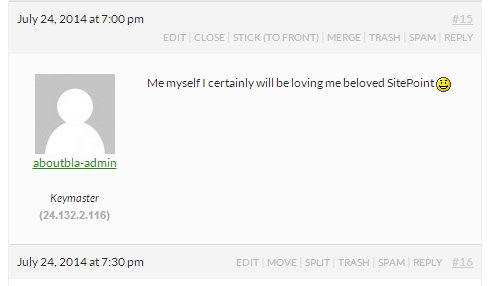 As you can see in this screenshot, setting up a new bbPress based forum is as easy as making a new post. You might think this approach could never serve a really useful forum, and you’re right. It is rather simplistic to say the least. Or is it? This is just the base from which you can build upon, but I always like a good place to start. After a few minutes of adding sub-forums and categories, people can start posting topics. This is where familiarity with WordPress has an advantage. So setting up a bare bones forum is pretty straightforward, and if this is what you’re after you can stop reading here. However, I want to add a bit more meat to it now, so let’s have a look at the main features. I’ll start with one of the features that really matters for a forum: User permissions. A solid permission system is important if you want to limit the usage of your site for certain users. Simply put, you don’t want them to be able to delete or edit each other’s messages or make new categories for example. We all know that WordPress by default has a great permissions system, and the bbPress plugin makes excellent use of it. bbPress comes with five pre-defined roles, which should be sufficient for most forums. Keymaster: The admin role, with all possible rights. Moderator: Used for keeping the forum tidy. Had almost the same rights as the Keymaster, except for being able to delete forums. Participant: For contributing forum members. This is the default role for new users. Of course it wouldn’t be WordPress if there wasn’t a plugin to add your own set of permissions. Seeing these default roles and their permissions, it is safe to say they have got this part well covered. Now let’s look at how easy it is to moderate posts which is just as important as user permissions. Edit/Trash/Spam: Needs to be there of course. Stick (to front): Make a topic sticky which puts it on top of the category. Merge: Move a topic into a similar topic, along with its replies. Split: Take a single reply, and spin it off into its own topic. I must say these are some very advanced features for a plugin which seemed pretty simple at first. The second way of moderating is by using WP admin. Here you will find all of the topics and replies listed in the same way as comments are displayed. It allows you to go quickly through the whole list without looking at each topic or reply individually. If you want to make it even easier there’s a moderation plugin available. This one comes in handy when your forum is becoming larger. It provides you multiple ways of notifying yourself and/or your moderators of new topics, replies or any suspicious activity (like anonymous comments). So moderation is another plus for bbPress. For a piece of free software, I think you’d have to agree that it’s really pretty good. What it really shows you is the developers really knew what they were doing and kept the focus on what is really most important for a forum. Being a WordPress plugin, bbPress also brings in a number of distinctive features. There is, of course, the ability to use widgets as you can with a normal WordPress installation. Using these widgets also helps you to shape the look of your forum. I particularly like the forum stats widget. The official bbPress forums I have used for this screenshot really give you a good insight on how professional your forum could look if you are prepared to give it a bit more attention (and also had a good number of users). There’s also the option to use shortcodes. 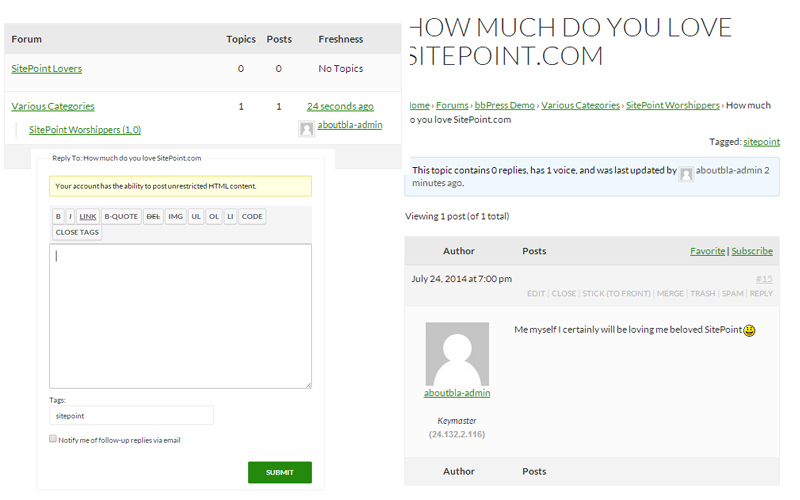 This is an easy way to incorporate elements of your forum into your posts or pages. You can even list a single reply, which is perfect if you want to base a blog post on it. Using these shortcodes also gives you the opportunity to promote your forum within your content. This is really unique, since a tool like vBulletin (one of the ‘Top Dogs’ on the forum software scene) can’t do this out of the box. It also comes with full BuddyPress integration, to allow for advanced user profiles and group forums. For those who’d like to know more, check out my article on BuddyPress. bbPress really is, all in all, an excellent plugin if you want to run an pretty advanced forum that is also still quite easy to manage. Let’s now take a look how it stacks up to some of the other WordPress forum plugins. I already covered one in my “15 things You May Not Know WordPress Can Do” article, which is ForumEngine. What ForumEngine brings to the table is mostly a slick look (understatement) and some funky jQuery tricks. Manageability, however, is quite limited as is it mostly a combination of WordPress posts plus comments. There’s also Simple Press, which comes with so many additional features that you will soon become overwhelmed. It certainly takes away the simplicity that bbPress offers. You could also consider a free tool like phpBB if you’re looking for more features. There’s also a plugin to connect phpBB to your WordPress site. What initially started out as a bit of a disappointment with bbPress being ‘too simple’ for a forum actually turned into being more of an admiration for what they have achieved. It is very hard to make managing a forum look so easy to users and they have certainly succeeded in that. bbPress really delivers on simplicity without sacrificing the most important functionality that a forum plugin really needs to include. 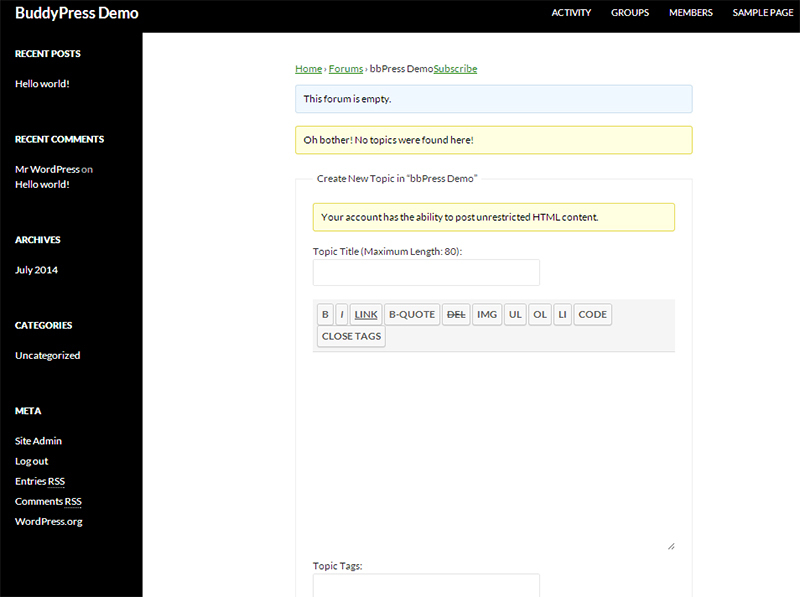 Even better, it makes good use of the WordPress integration. If you are prepared to put in around an hour of your time after installing it, you’ll have a very decent WordPress-powered forum in no time.